I started by making some chicken meatballs. I added quite a few herbs to make them nice and flavorful. Beyond that it is a fairly standard meatball process. Once the meatballs were formed I fried them in a bit of olive oil until they were golden brown, turning every so often to ensure they were cooking evenly. Once the chicken meatballs were in the pan I started cutting up the veggies for the soup component. Like most of my soup recipes this one started out with diced onion and sliced carrots and celery. Add in a couple cloves of minced garlic and some herbs and cook for another minute or two and then we are ready to add the stock. As it is simmering I boil water to cook the noodles. I like to cook them separately so the soup doesn’t get too thick. Let the meatballs simmer in the broth for 15 minutes or so and you are ready to enjoy chicken meatball noodle soup. 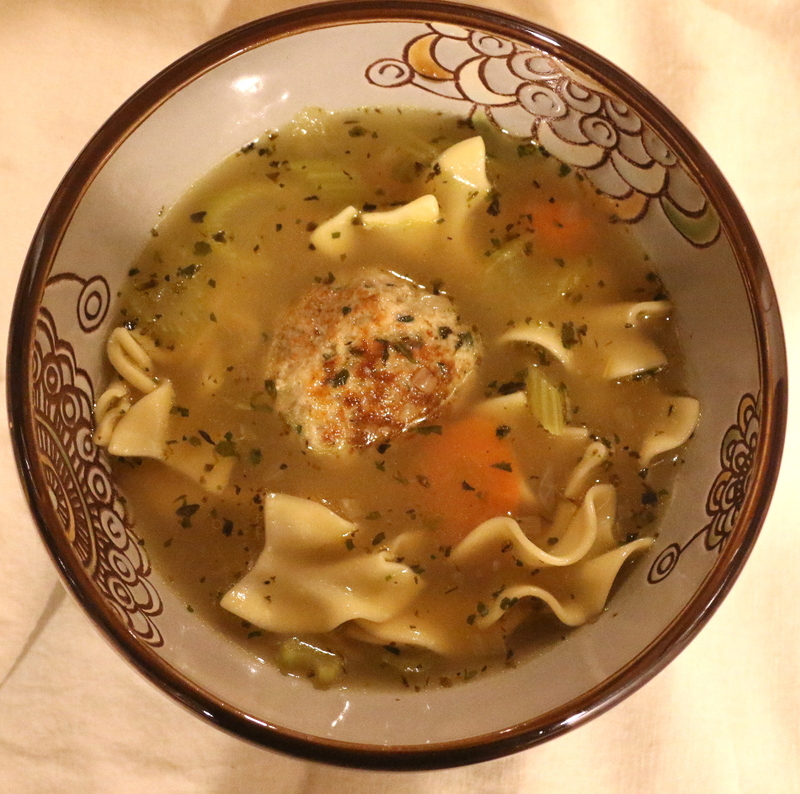 I love our traditional chicken noodle soup recipe, but this one was a nice change of pace. Give it a try on a cold winter evening, you won’t be sorry. In a medium bowl add ground chicken, bread crumbs, egg, sage, rosemary, garlic powder, 1tsp dried parsley, dried minced onion, thyme, salt and pepper. Combine all ingredients until they are thoroughly combined. Try not to over-mix to prevent the meatballs from getting too dense. Form into meatballs, I start with just less than ¼ cup of mixture and form into the balls. Add olive oil to preheated skillet and add meatballs. Turn to brown all sides. Remove meatballs once browned and set aside. While the meatballs are cooking, add olive oil to heated soup pot and saute onion, carrots, celery and garlic for about five minutes. While the soup is simmering, cook the egg noodles in boiling water until just less than al dente. Strain and set aside. Add salt and pepper and taste soup and add more if needed. Add noodles and soup to bowl and serve.